What happens when you combine conspicuous consumption and conspicuous productivity? 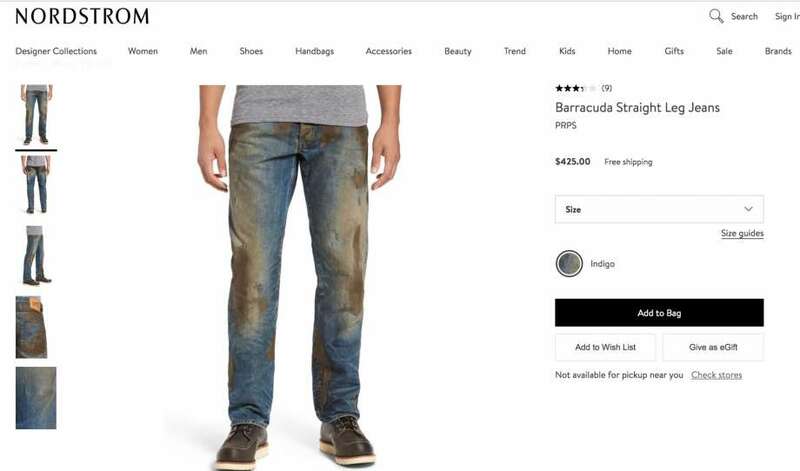 You get Barracuda Straight Leg Jeans—complete with “crackled, caked-on muddy coating”—on sale for $425 at Nordstrom. The clothing of the leisure class reflected this distancing from the world of work—conspicuous consumption combined with conspicuous leisure and conspicuous waste. In dress construction this norm works out in the shape of divers contrivances going to show that the wearer does not and, as far as it may conveniently be shown, can not engage in productive labor. Beyond these two principles there is a third of scarcely less constraining force, which will occur to any one who reflects at all on the subject. Dress must not only be conspicuously expensive and inconvenient, it must at the same time be up to date. Nordstrom’s muddy jeans are therefore a perfect example of contemporary predatory culture, when those at the top are afforded the luxury of ironically quoting—but not actually doing—any productive work. Instead, they capture a portion of the surplus and use it to purchase clothing that—in the form of conspicuous consumption, leisure, and waste—shows they are exempted from the exigency of work imposed on everyone else, who are of course required to dress in neat and clean uniforms, just like the servants of the first Gilded Age. Now, in the latest stage of predatory culture, those at the top can purchase fake mud-stained jeans while McDonald’s employees will now wear uniforms reminiscent of the Hunger Games. The dress of women goes even farther than that of men in the way of demonstrating the wearer’s abstinence from productive employment. . .
the woman’s apparel not only goes beyond that of the modern man in the degree in which it argues exemption from labor; it also adds a peculiar and highly characteristic feature which differs in kind from anything habitually practiced by the men. This feature is the class of contrivances of which the corset is the typical example. The corset is, in economic theory, substantially a mutilation, undergone for the purpose of lowering the subject’s vitality and rendering her permanently and obviously unfit for work. Where does all the surplus in the U.S. economy go? 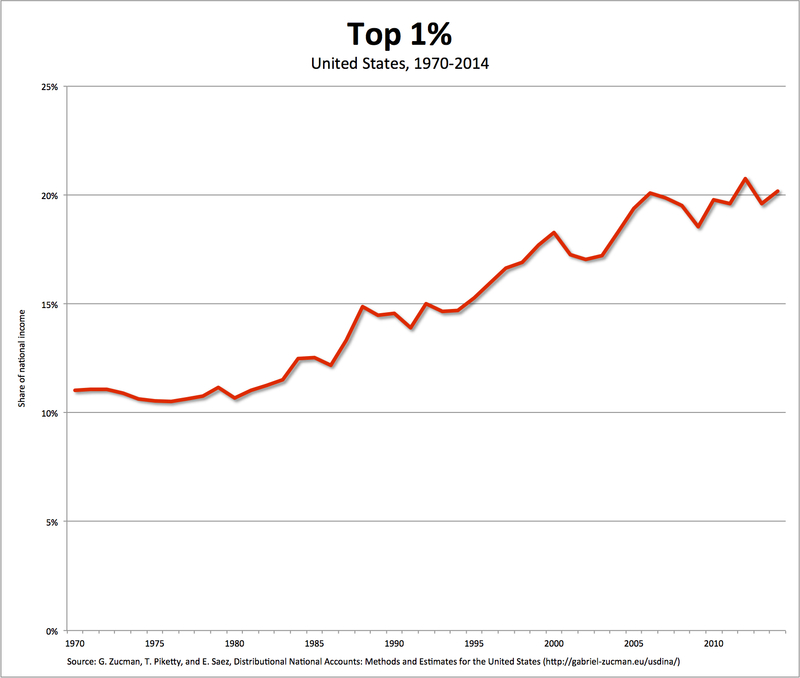 Well, a large chunk of it is captured by the top 1 percent, whose share of national income almost doubled between 1970 and 2014—from 11 percent to 20.2 percent. Equally interesting is the composition of that growing share of national income, which we can decompose thanks to new data from Thomas Piketty, Emmanuel Saez, and Gabriel Zucman. 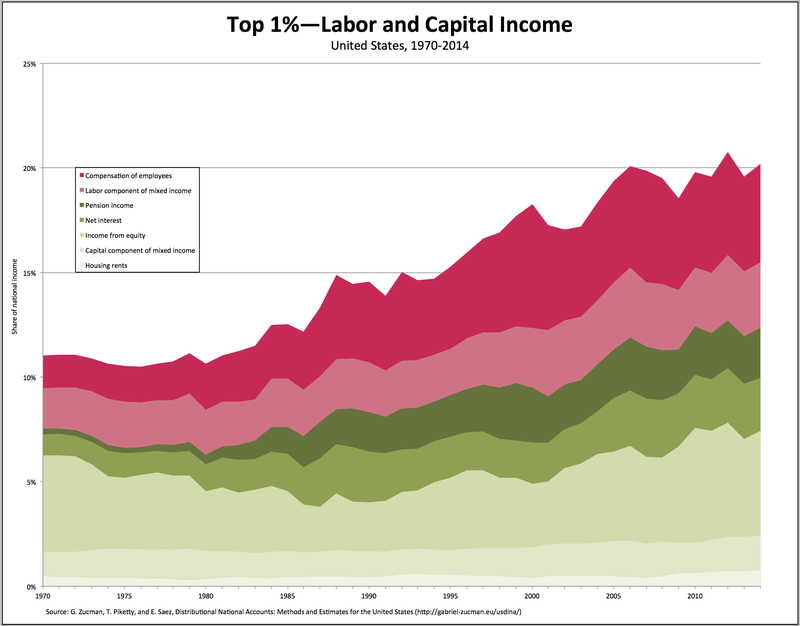 As can be seen in the chart above, by 2014 the top 1 percent derived over half of their incomes from capital-related sources. In earlier decades, from the late-1970s to the late-1990s, a much larger share of their income came from labor sources. They were the so-called “working rich.” This process culminated in 2000 when the capital share in top 1 percent incomes reached a low point of 49.4 percent. Since then, however, it has bounced back—to 58.6 percent in 2014. Thus, the “working rich” of the late-twentieth century may increasingly be living off their capital income, or are in the process of being replaced by their offspring who are living off their inheritances. 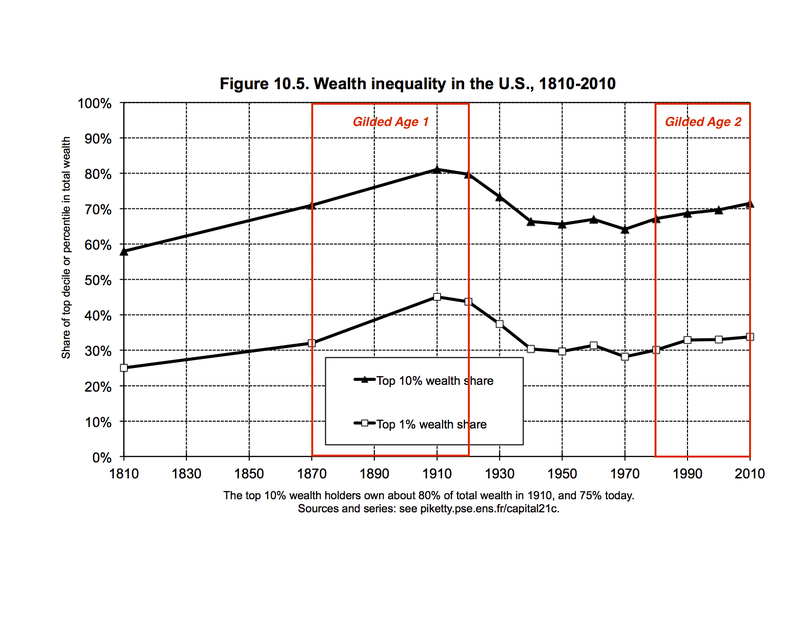 What this means, in general terms, is the growth of inequality over decades is due to the ability of the 1 percent to capture a large portion of the growing surplus. 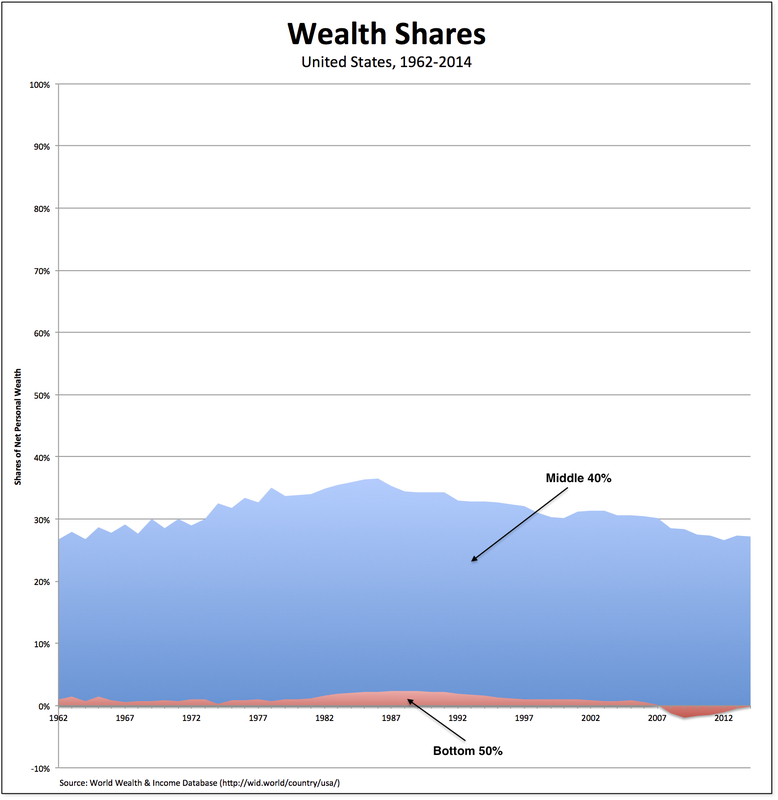 But there has also been a change in the nature of that inequality in recent years—which is not due to escalating wages at the top, but to a boom in income from the ownership of stocks and bonds. 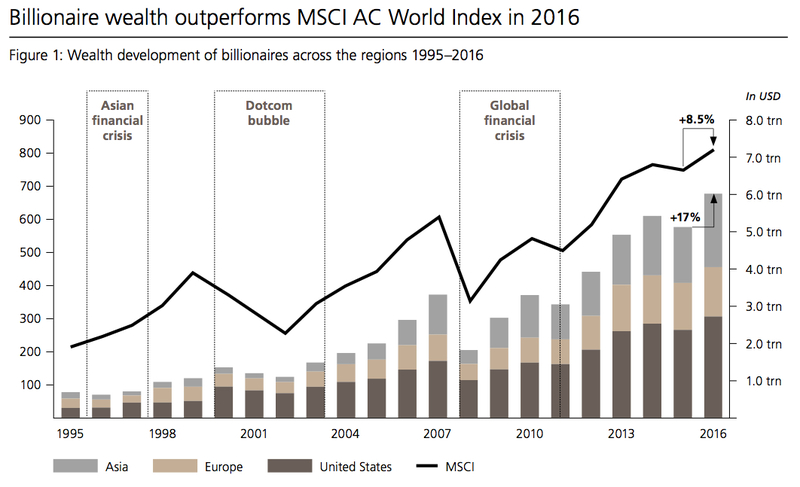 The high incomes of the “working rich,” it seems, have increasingly been used to purchase financial assets. It looks then as if the working rich are either turning into or being replaced by rentiers—thus mirroring, after a short interruption, the structure of inequality last seen during the first Gilded Age. There are a few chroniclers of the American condition I’ve turned to and cited over the years, journalists whose reporting helps us make sense of the current economic and political predicament in the United States—especially the condition of the working-class and the rejection of much mainstream thinking during the current presidential campaign. They include Thomas Frank, Esther Kaplan, Frank Rich, and George Packer. That list should probably now include Alexander Zaitchik. I haven’t yet read his new book, The Gilded Rage: A Wild Ride Through Donald Trump’s America. But, based on interviews (here and here), an excerpt, and other reporting, I’d say he’s a candidate. CL: OK I’ve read your book, and what strikes me immediately is how ordinary the people seem. You know, we’re used to looking at people like the Tea Party, Sarah Palin’s amazing campaign, then the messages from Fox news and all of these right wing people and it seems that they’re all crazy, but a lot of Trump supporters just seem to be regular Americans. So how do you account for that? AZ: The first thing to note is that the Tea Party phenomenon may superficially look like a precursor to the Trump insurgency but it’s important to remember that the Tea Party was essentially a corporate-funded fake explosion. They wanted to throw a monkey wrench in the Obama plans and it was funded by the Koch brothers, our biggest industrialists and it involved whipping the evangelicals into a frenzy and had a very different flavour than the Trump phenomenon which is not very religious at all. Trump is no evangelical’s idea of an ideal candidate for a lot of obvious reasons. And it was also opposed from the beginning by the big money, the deep pockets, and the lobbyists’ networks that traditionally pick the winners in the Republican Party and also manufactured the Tea Party. Trump represents the people who feel hoodwinked by decades of Republican big money corporate politics and realize what the Tea Party was and basically it’s their revenge. They were being told from the beginning that Trump was not an acceptable candidate, anyone who voted for Trump was a bad Republican, if not a bad human being and they just said we don’t care! We’re done listening to you. We’re not going to take Jeb Bush, John Kasich, Marco Rubio or any of these sorts of corporate Republican types that they’ve been fed for as long as they can remember and to your question about ordinary people, they are ordinary people; they’re not paid operatives, they’re not the sort of Evangelical nutjobs you were describing. A lot of them were conservative Democrats, worked for most of their lives in you know good paying unionized labour and now see communities that are parking lots, McDonald’s, strip malls and a whole bunch of people on heroin. It’s really hard to explain how devastated a lot of these parts of the country are now and people are sliding or treading water living paycheck to paycheck and even people who have pensions or who maybe did OK during the height of the American economy in the golden age are seeing the next generations beneath them with very dim prospects constantly becoming dimmer and that’s where the anger of the title comes from. It was just a lot of rage bordering on desperation and they’re done listening to their Republican masters who they feel brought them to this point. The American Economic Association was, in the beginning, a radical organization—founded in 1885, according to Marshall I. Steinbaum and Bernard A. Weisberger, by “Richard Ely, an avowedly Christian Heidelberg-trained professor at Johns Hopkins with a calling to make economics a friend of the working man.” Now, of course, it is anything but radical. University presidents seeking stature for their institutions appealed to rich donors among the period’s Robber Barons, and that appeal was unlikely to be successful when rabble-rousers in the economics department were questioning the foundations of American capitalism, in particular the monopolization and labor exploitation that made the Robber Barons rich in the first place. . .
What had happened was that economists realized there was much to be gained in terms of professional stature and influence from making themselves appealing to the establishment, so they banished those elements that tainted them by association. In 1895, one of Ely’s students, Albion Small, the founding chair of the new, Rockefeller-endowed University of Chicago’s Sociology Department, did not come to the aid of another Ely student, Edward Bemis, after the latter’s public criticism of the Chicago traction [streetcar] monopoly brought down the wrath of the university’s president William Rainey Harper and its conservative chair of economics, J. Laurence Laughlin. Despite episodes like those of Adams and Bemis, economics was by no means as conservative then as it eventually became starting in the 1970s, but neither would it countenance a direct challenge to the economic status quo nor affiliate itself with radical elements in organized labor or elsewhere. Even Ely himself eventually came around after his own notorious trial before the Wisconsin Board of Regents in 1894. He returned to the AEA as its President in 1900, and though he was long affiliated with the “Wisconsin Idea” and its progressive exponent, Governor Robert LaFollette, he was careful not to stray far from the new, milder orthodoxy. 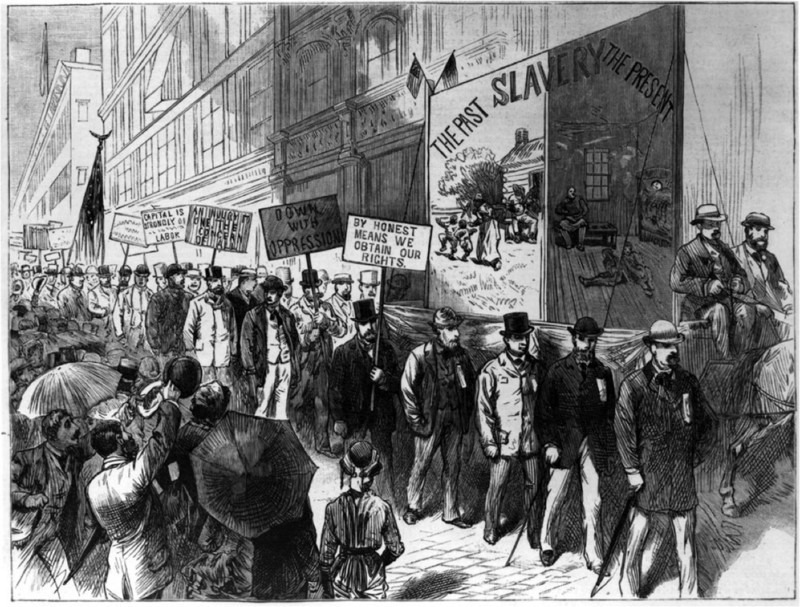 Perhaps the causes of the transformation in U.S. economics during the first Gilded Age help explain why academic unfreedom in economics is so prevalent now, in the second Gilded Age.